No really- this book. Ok, so I read Shatter Me. I thought it was good, but absolutely not the best book ever. I decided to give Unravel Me a chance (mainly because of Chapter 62). THIS BOOK! It has made me completely unable to make coherent thoughts. I neglected my family, my house, everything so I could devour this book. Unravel Me is ruthless. It is fast paced action, heart wrenching drama, and enough angst to make me bite off all of my already barely there nails! 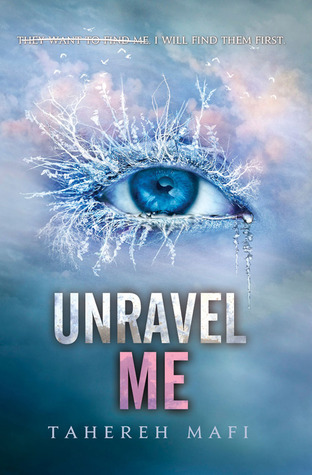 I feel like I was put through an emotional wringer with Unravel Me. It literally is one of the most romantically dramatic books that I have read- I loved every second of it. I want to hug Tahereh Mafi for letting me be part of this journey. I just want to thank her for exsisting! Did you really think I was going to give away any of the details in this book? HA! Go get it yourself and then join me in the Warner love. This book is so visual- it would be a phenomenal movie. I found myself playing out scenes in my head. Ugh! I need this to be a movie! Well, if this review isn't convincing enough, I don't know what would be. Glad this is making moves up my TBR list because this sounds like an exciting read.